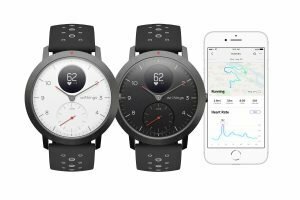 Withings is back with their first product released since reacquiring itself from Nokia in May 2018. The Steel HR Sport has several notable improvements since its last iteration under the Nokia label. 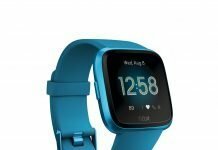 Improvements to the hybrid smartwatch include an updated sporty design, connected GPS, a more readable OLED display, fitness level analytics which will estimate VO2Max, expanded support for notifications, and the same great battery life of up to 25 days. 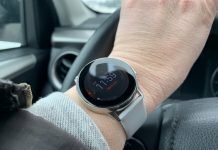 We reviewed the Nokia Steel HR several months ago and it received high marks in its very accurate heart rate sensor, batter life, and style. It’s my personal favorite watch to wear for dressy occasions. It has an attractive classic look to it. The main area where I thought it needed an improvement was distance estimates. Since the original Steel HR didn’t have connected GPS, it relied upon an estimated distance for steps and stride length and that can be difficult to get accurate results. So, I think connected GPS is a big improvement for the Nokia Steel HR Sport. Another area where I took off some points was the difficulty in reading the small OLED display in bright sunlight. The good news is that Withings sent out a notable software update to the Nokia Steel HR which includes or more readable OLED display. The text is larger and notifications have been improved too. Notifications were limited to text and emails primarily but now they have been expanded for several apps. The Health Mate app is still used for both the Nokia branded device and the Withings and it is capable of connecting with Apple Health, Google Fit, and MyFitnessPal. 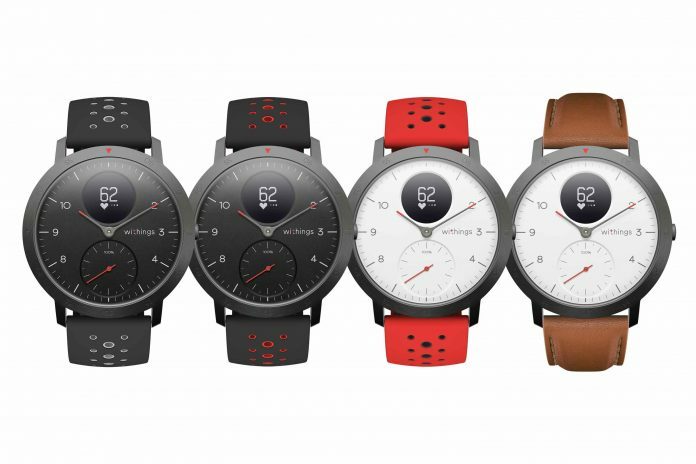 The Nokia Steel HR was available in two different sizes but the Withings Steel HR Sport is available in only 40 mm but that’s a good size that should accommodate smaller and larger wrists. Personally, I prefer the look of the newer dial. Numbers are displayed instead of tick marks which makes for easier telling of time with a quick glance. The same step goal mechanical dial is still on the Steel HR Sport. This is a dial that lets you know how close you are to your step goal. The Nokia Steel HR supports 30 different activities including yoga, volleyball, rowing, boxing, skiing, and even ice hockey amongst others. Connected GPS can be used with walking, running, and cycling. Users will be able to view their route on a map thorugh the Health Mate app after finishing the activity but heart rate, pace, and distance is available to be displayed on the watch during the GPS activity. Another improvement is that with the Steel HR Sport users select the activity before beginning it through the watch. With the older watch the activity is selected after finishing the activity. Sleep tracking is still supported with Withings Smart Wake-up™ technology. The watch can detect the optimal time to wake you up withing so many minutes of an alarm you’ve set. It’ll try waking you when you’re in a lighter sleep pattern so you don’t wake up so groggy. The watch face is available in black or white and there are different strap options. We personally think this is a very good looking hybrid smartwatch and with Withings back at the command, I think we’ll see continued improvements. The Withings Steel HR Sport is available for purchase from Withings, on Amazon, and other retailers. 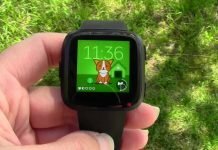 Next articleIs the Apple Watch Series 4 Good for Bicycling?